Summary: Living in a small, sheltered community on Vancouver Island, Maya and her friends have grown up under the shadow of a town built by a medical research company. With just over 200 people living there, everyone knows everyone and it is generally acknowledged that the town’s secrets aren’t secrets at all, but simply things people don’t talk about. Everything changes though when some strangers come to town knowing more about the true purpose of the community than those who live in it. As Maya encounters truths about herself she never imagined, her world is thrown into upheaval as everyone is driven out of town by an intentionally set forest fire. Headed into the sky on a helicopter with her friends, Maya has no idea what is in store for her future. Review: The first book in the Darkness Rising trilogy, The Gathering by Kelley Armstrong sets the stage by letting her reader into Maya’s life. Having been present at the accidental death of her best friend Serena, Maya’s life has not been the same since. She holds herself apart, finding her closest relationship is with Daniel, Serena’s boyfriend as they protect each other in their struggle to move on. With questions about her own mysterious past, Maya’s love of and connection with animals reveals more than she knows at first, but when a teen named Rafe comes to town he has some unexpected answers for her. Nothing is as it seems in the predictable community Maya believes she has grown up in, and by the time she is forced out of town by a forest fire, she has only a small inkling of what is to come. Once things get going in Armstrong’s book, it’s a race to the finish as everything just falls apart. The Gathering is more about setting up characters and the plot rather than moving it along, but when things get going it is fortunate that the rest of the series has already been published. Maya is a spirited character with a developing love triangle on her hands whether she knows it or not, and how she learns to trust the others she has known her whole life will be telling in the coming books. “We started with the snake, dumping in a couple of live slugs. Serena used to argue that killing one creature to save another made no sense. We’d have long debates about that. Not arguing, just working it through. I agreed she had a point, but the snake was rare and the slugs weren’t so it made sense from a conservation view. 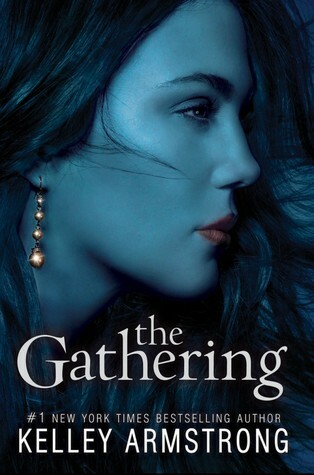 The Gathering by Kelley Armstrong is published by Doubleday Canada, (2011).